I've reviewed my fair share of movies and TV shows. A number of them have come from the USA Network. Of all of them, I would say that White Collar is easily my favorite. The rich well developed characters and the fun stories are so addicting. While Season 4 seemed to be hitting a bit off the mark as with previous seasons, I still found it entertaining and worth the investment. Season 4 picks up a few months after season 3 ended. Former con man turned FBI asset Neal Caffrey (Matt Bomer) is hiding out on an island with his con man friend Mozzie (Willie Garson). Back at the FBI, there is a man hunt on for Neal, and his FBI handler Peter Burke (Tim DeKay) is trying to find Neal first to keep him from the more serious consequences of his actions. Obviously, this little drama plays out in the first few episodes, and the show then shifts back to the more familiar setting of New York. Once again, Neal is working with Peter and the rest of his team, agents Diana Barrigan (Marsha Thomason) and Clinton Jones (Sharif Atkins), to bring down white collar criminals. They tackle such cases as a widow who may have committed fraud to get life insurance, museum heists, and even a hot tip boxing rings. Rounding out the cast is Peter's wife Elizabeth (Tiffany Thiessen) who even manages to get involved in the cases occasionally. But when Neal returns to New York, he decides to find out the truth about his family's history, a subject that has always been clouded in mystery. Doing so means the death of a family friend and a conspiracy that leads to some powerful people. Will Neal and Peter be able to take down these personal villains? Actually, it was the on-going story that was my biggest issue with this season. I just didn't get into it like I did with the ones from the previous seasons. Part of that is because the tensions it creates upon occasion between Neal and Peter just felt forced. After all these two have gone through, the secrets they keep in this season they would never keep from each other. And part of it is because the plot just didn't feel like White Collar to me. And maybe my expectations were too high after the exceptional third season. I doubt anything will ever touch that one. This particular over-arching story felt as forced as the tension between our two main leads. It just wasn't the strongest that the show has ever pursued. However there is still plenty of fun to be had in these sixteen episodes. Most episodes do still feature a case of the week, and those are always cool. It's amazing just how Neal, Peter, and the team are able to take down the villain of the week. At no point did I ever feel as though the cases and how they get solved were a bit under done in light of character development. Something that the most recent season of Bones seems to have been doing and while I do love character development, it shouldn't be at the cost of the episodes story. The laughs still come as well. No, this isn't a comedy, but it is a light drama. There are one liners in every episode, and they will make you smile if not outright laugh. Mozzie gets most of those, especially if he is sharing a scene with Elizabeth. Those two have all the best scenes. Not that Peter has anything to worry about. Elizabeth and Peter have a solid marriage, something I appreciate seeing on TV. It's nice to watch a drama and know the drama won't come from that source. Another show where the wife is always fed up with her husband's government job would feel a bit contrived. This four disc set contains wide screen and full surround on all sixteen episodes. This being a standard definition DVD set, it lacks the same punch that a Blu-ray would. It still amazes me that some shows and movies now still arrive on standard definition. Given the popularity of Blu-ray, one would think that every studio would push for it. Still, if you're familiar with standard DVD video quality, then you know what to expect here. White's and blacks are sharp, if just a tad grainy now and again, very little pixilation to be seen, you'd have to really keep your eye out for it. Audio delivers well, at no point was there any background hissing or popping, although this isn't your big blockbuster movie so the audio channels don't get much of a workout. In the Director's Chair: Tim Dekay steps behind the camera to direct an episode and he gives us his thoughts on what that was like. Commentary: Commentary from Tim Dekay, Matt Bomer, Jeff Eastin, and Willie Garson on the episode "In the Wind"
While the fourth season of White Collar wasn't my favorite season, it's only because the show has set the bar so high. With a decent audio/video presentation, and some entertaining special features, it makes for an enjoyable watch. For hard-core fans of the show, this season is worth the price. Recommended. 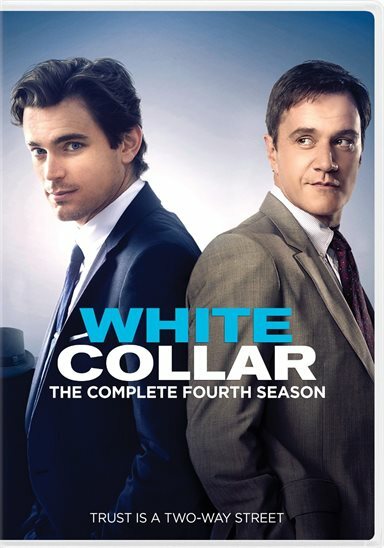 Download White Collar: Season Four from the iTunes Store in Digial HD.